LDAP lets you authenticate GitHub Enterprise Server against your existing accounts and centrally manage repository access. LDAP is a popular application protocol for accessing and maintaining directory information services, and is one of the most common protocols used to integrate third-party software with large company user directories. If you want to authenticate users without adding them to your identity provider, you can configure built-in authentication. For more information, see "Allowing built-in authentication for users outside your identity provider." GitHub Enterprise Server usernames can only contain alphanumeric characters and dashes (-). 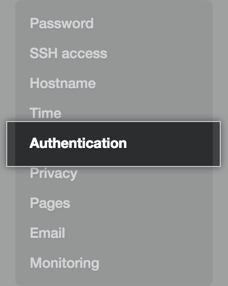 GitHub Enterprise Server will normalize any non-alphanumeric character in your account&apos;s username into a dash. For example, a username of gregory.st.john will be normalized to gregory-st-john. Note that normalized usernames also can&apos;t start or end with a dash. They also can&apos;t contain two consecutive dashes. If multiple accounts are normalized into the same GitHub Enterprise Server username, only the first user account is created. Subsequent users with the same username won&apos;t be able to sign in. When you configure LDAP access for users via the Management Console, your license seats aren&apos;t used until the first time a user signs in to your instance. However, if you create an account manually using site admin settings, the license seat is immediately accounted for. Warning: Before configuring LDAP on your GitHub Enterprise Server instance, make sure that your LDAP service supports paged results. Optionally, select Allow built-in authentication to invite users to use built-in authentication if they don’t belong to your GitHub Enterprise Server instance&apos;s identity provider. Use these attributes to finish configuring LDAP for your GitHub Enterprise Server instance. Host Required The LDAP host, e.g. ldap.example.com or 10.0.0.30. If the hostname is only available from your internal network, you may need to configure your GitHub Enterprise Server instance&apos;s DNS first so it can resolve the hostname using your internal nameservers. Port Required The port the host&apos;s LDAP services are listening on. Examples include: 389 and 636 (for LDAPS). Administrators group Optional Users in this group are promoted to site administrators when signing into your appliance. If you don&apos;t configure an LDAP Administrators group, the first LDAP user account that signs into your appliance will be automatically promoted to a site administrator. Restricted user groups Optional If specified, only users in these groups will be allowed to log in. You only need to specify the common names (CNs) of the groups, and you can add as many groups as you like. If no groups are specified, all users within the scope of the specified domain base will be able to sign in to your GitHub Enterprise Server instance. User ID Required The LDAP attribute that identifies the LDAP user who attempts authentication. Once a mapping is established, users may change their GitHub Enterprise Server usernames. This field should be sAMAccountName for most Active Directory installations, but it may be uid for other LDAP solutions, such as OpenLDAP. The default value is uid. Profile name Optional The name that will appear on the user&apos;s GitHub Enterprise Server profile page. Unless LDAP Sync is enabled, users may change their profile names. Emails Optional The email addresses for a user&apos;s GitHub Enterprise Server account. SSH keys Optional The public SSH keys attached to a user&apos;s GitHub Enterprise Server account. The keys must be in OpenSSH format. GPG keys Optional The GPG keys attached to a user&apos;s GitHub Enterprise Server account. Disable LDAP authentication for Git operations Optional If selected, turns off users&apos; ability to use LDAP passwords to authenticate Git operations. Enable LDAP certificate verification Optional If selected, turns on LDAP certificate verification. Select Disable username and password authentication for Git operations in your LDAP settings to enforce use of personal access tokens or SSH keys for Git access, which can help prevent your server from being overloaded by LDAP authentication requests. We recommend this setting because a slow-responding LDAP server, especially combined with a large number of requests due to polling, is a frequent source of performance issues and outages. 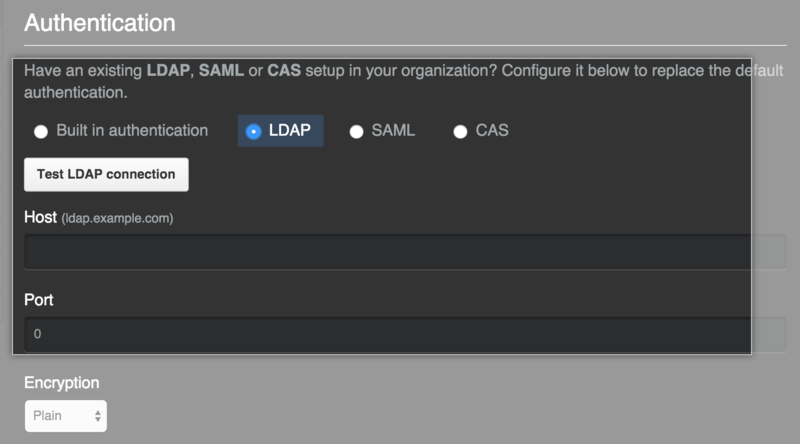 Select Enable LDAP certificate verification in your LDAP settings to validate the LDAP server certificate you use with TLS. LDAP Sync lets you synchronize GitHub Enterprise Server users and team membership against your established LDAP groups. This lets you establish role-based access control for users from your LDAP server instead of manually within GitHub Enterprise Server. For more information, see "Creating teams." If you&apos;ve allowed built-in authentication for users outside your identity provider, and the user is using built-in authentication, move on to the next user. If no LDAP mapping exists for the user, try to map the user to an LDAP entry in the directory. If the user cannot be mapped to an LDAP entry, suspend the user and move on to the next user. If there is an LDAP mapping and the corresponding LDAP entry in the directory is missing, suspend the user and move on to the next user. If the corresponding LDAP entry has been marked as disabled and the user is not already suspended, suspend the user and move on to the next user. If the corresponding LDAP entry is not marked as disabled, and the user is suspended, and Reactivate suspended users is enabled in the Admin Center, unsuspend the user. If the corresponding LDAP entry includes a name attribute, update the user&apos;s profile name. If the corresponding LDAP entry is in the Administrators group, promote the user to site administrator. 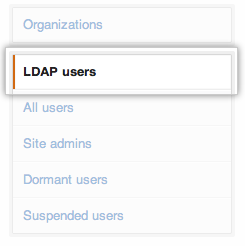 If the corresponding LDAP entry is not in the Administrators group, demote the user to a normal account. If an LDAP User field is defined for emails, synchronize the user&apos;s email settings with the LDAP entry. Set the first LDAP mail entry as the primary email. If an LDAP User field is defined for SSH public keys, synchronize the user&apos;s public SSH keys with the LDAP entry. If an LDAP User field is defined for GPG keys, synchronize the user&apos;s GPG keys with the LDAP entry. Note: LDAP entries can only be marked as disabled if you use Active Directory and the userAccountControl attribute is present and flagged with ACCOUNTDISABLE. If a team&apos;s corresponding LDAP group has been removed, remove all members from the team. If LDAP member entries have been removed from the LDAP group, remove the corresponding users from the team. If the user loses access to any repositories as a result, delete any private forks the user has of those repositories. If LDAP member entries have been added to the LDAP group, add the corresponding users to the team. If the user regains access to any repositories as a result, restore any private forks of the repositories that were deleted because the user lost access in the past 90 days. When LDAP Sync is enabled, site admins and organization owners can search the LDAP directory for groups to map the team to. Members of the LDAP group who have GitHub Enterprise Server user accounts, which is disclosed when creating a team synced with that LDAP group. If disclosing such information is not desired, your company or organization should restrict the permissions of the configured Domain search user in the admin console. If such restriction isn&apos;t possible, contact GitHub Enterprise Support or GitHub Premium Support. GitHub Enterprise Server supports these LDAP group object classes. Groups can be nested. You can view the full list of LDAP users who have access to your instance and provision new users. Sign in to your GitHub Enterprise Server instance at http(s)://HOSTNAME/login. Unless LDAP Sync is enabled, changes to LDAP accounts are not automatically synchronized with GitHub Enterprise Server. To use a new LDAP admin group, users must be manually promoted and demoted on GitHub Enterprise Server to reflect changes in LDAP. 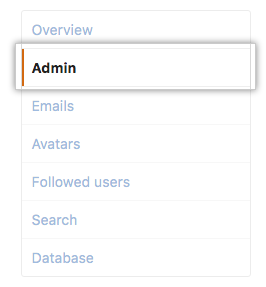 To add or remove LDAP accounts in LDAP admin groups, promote or demote the accounts on GitHub Enterprise Server. To remove LDAP accounts, suspend the GitHub Enterprise Server accounts. If LDAP Sync is enabled, removing a user&apos;s LDAP credentials will suspend their account after the next synchronization run. If LDAP Sync is not enabled, you must manually suspend the GitHub Enterprise Server account after you remove the LDAP credentials. For more information, see "Suspending and unsuspending users".